Myrtle Beach is a fun place with tons of things to do... and you need to be able to find your way around to enjoy everything this area has to offer. !!! The Myrtle Beach map by Rand McNally (See all World Atlases & Maps) pictured on the right is a conveniently sized Rand McNally street atlas which covers the cities and communities of Myrtle Beach, Atlantic Beach, Briarcliffe Acres, Garden City Beach, Litchfield Beach, Little River, Murrells Inlet, Litchfield Beach, North Myrtle Beach, Pawleys Island, Surfside Beach, and the entire Grand Strand. The map includes airports, hospitals, police stations, schools, government buildings, shopping centers, parks, golf courses, post offices, and more. Travel routes in the area include major highway symbols and line differentiation for controlled and uncontrolled access, undivided highways, streets, and minor roads. Don't get lost while you're on vacation ! 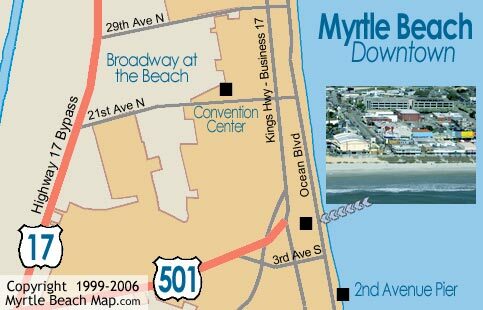 Get the Myrtle Beach map and drive straight to your favorite hotel, attraction, golf course and restaurants. To the left is a map of the Myrtle Beach downtown area, which is home to Ripley's Believe It or Not, the former Myrtle Beach Pavilion, Peaches Corner, Oceanfront Bar and Grill, the Gay Dolphin Gift Shop, Family Kington Amusement Park, and more. For streets and attractions of the entire Grand Strand, see the Myrtle Beach interactive map. You can zoom in and out and move and search all areas. The interactive map requires flash player. Internet Marketing by Myrtle Beach Inc. ©1999-2018.